Set to be one of the most exciting new charter listings of 2019 Limitless is currently under construction at Italian yard Azimut and due to deliver in May 2019. She will then be available for charter around Croatia and the East Mediterranean. 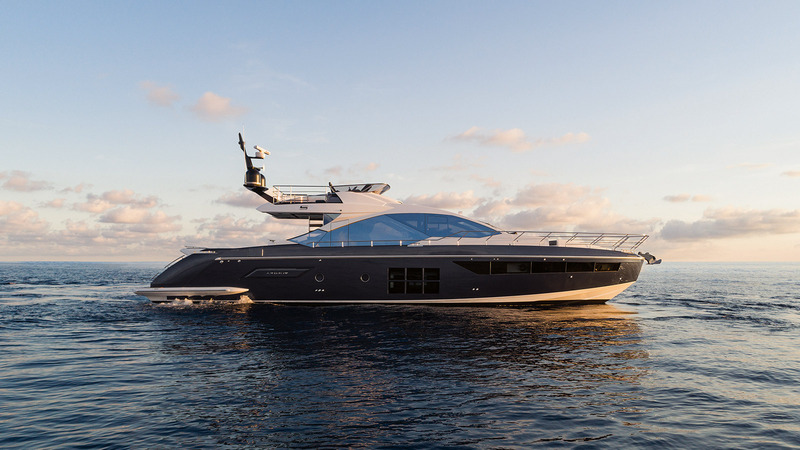 Designed by Stefano Righini the S7 model made its debut in 2017 and is part of Azimut’s range of luxury sport yachts. Limitless is the sportfly version of the S7 and, built from FRP, she is light and fast with a V-shaped hull. Powered by three Volvo PENTA D13 IPS1050 engines, she flies through the water at an incredible cruising speed of 30knots, reaching maximum speeds of 36 knots – perfect for thrillseekers! A great choice for smaller groups, families or couples, Limitless can welcome up to eight guests in four cabins, with two double cabins – the master and VIP – and two twins. The master is particularly inviting, with generous proportions and features including a private office. She carries two experienced crew to create a truly special charter experience for her guests, who can relax and enjoy the beauty of Mediterranean waters in true luxurious comfort. With so many different spaces onboard charter guests will be spoilt for choice when choosing which part of the yacht to enjoy.